Pulley System usage and warnings. Pulley systems are a great way to hoist up apparatus, and to lower a performer in event of problems. There are also DANGERS of using pulleys and ropes if PERFORMING on them. to climb up and swap out apparatus onto a FIXED point on HEADER. but NEVER perform on just a single pulley system. 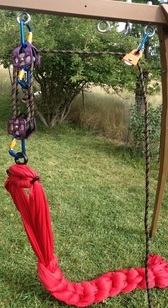 For example: if hoisting a 100 lbs performer with a rope through a single pulley, The rope from the performer to the pulley has 100 lbs on it, BUT the other end of the rope that is tied of to a leg of the rig is countering that 100 lb load by applying a 100 lb force downward to hold the performer up. THEREFORE, the Pulley sees a 200 lb load. 100lb from performer and 100 lb from rope tied off to leg of rig. The ONE leg that the rope is tied off to is is seeing that ENTIRE 100 lb for force used to hold the performer up and the header sees the other 100 lbs of weight of the performer which is distributed to the 4 legs. simply put, the 3 legs without the rope tied to it have 25 lbs of weight that they support, but the leg with the rope tied to it has the 25 lbs of weight AND the 100 lbs of force used to hold up the performer, meaning this leg has 125 lbs of force on it while the other legs only have 25 lbs. Without a pulley and with apparatus suspended from a fixed point on header, the header sees only the 100 lbs of the performer and the 100 lbs is distributed to the 4 legs and all 4 legs have equal force/weight on them. OK, now that is for just holding the performer up. BUT, what about dynamic forces from DROPS? of only a distance of 5 feet can generate a SHOCK load of near 2000 lbs. That means that with the single pulley, the rope to the pulley sees a 2000 lbs shock and the rope tied to the leg sees a 2000 lb shock and the pulley therefore sees a 4000 lbs shock. And the ONE leg that the rope is tied to sees the entire 2000 lbs shock load. This is maxing out the pulley's, the carabineers, the rope, the rigs header. Use a block and tackle style pulley system that has a mechanical advantage to reduce the loads on any one strand of rope and distribute the forces more evenly. With a 3:1 a strong person or 2 people can actually hoist up a performer if needed but a 4:1 is better suited for that. The higher the loads and shock loads the more of an advantage is needed. This is a 2:1 system. NOTE that there are 2 rope sections going from the bottom pulley where the performer is to the top pulley where it attaches to the Header. This means that the performer is now supported by the strength of 2 ropes. But most importantly is that the other end of the rope that is tied to the leg is seeing only 1/2 of the weight of the performer. The top pulley sees the 100 lbs performer and distributes the to the 4 legs, so 25 lbs to each leg. and the rope goes to the leg tie off point and sees only 50 lbs of the performers weight. now that one leg that the rope is tied too is seeing a TOTAL of 75 lbs of weight/ force, not the 125 lbs as it would with just a single pulley system. So, if doing that BIG dead drop. the top header sees sees the 2000 lb shock load and distributes it to the 4 legs (500 lbs to each leg) . The pulley sees the 2000 lbs shock plus the force of the one rope holding it to the leg as 1000 lbs (remember, 2:1) for a total of 3000 lbs on the pulley and carabiner. And the one leg with the rope tied to it sees that 500 lbs ditributed by the header PLUS the 1000 lbs shock load from the one rope for total of 1500 lbs shock load to the one leg of the rig. A big improvement over the 4000 lbs shock load on a single pulley system and 2000 lbs to the one leg. BUT still REALLY high shock load for JUST ONE LEG to endure. A 3:1 system has 3 ropes holding the performer with 1 rope holding it. Now the top pulley and header still sees the 100 lb performer but the 1 rope holding it only sees 1/3 or 33 lbs. which is tied off to the leg of rig. meaning the the the ONE leg sees the 25 lbs distributed from the header and the 33 lbs from the rope tied to it for a total of 58 lbs. getting better. BUT the leg now sees 500 lbs from the distribution from the header plus the 666 lbs from the one rope tied to it for a total of 1166 lbs for weight and shock load. What this means is that for static performances a simple 2:1 system will do nicely and 1 3:1 if you want to hoist the performer. BUT for big drops. You need extra force distribution to not over load any one section of rig or rigging hardware. For the really big stuff and for easy hoisting of performers, consider a 4:1 system. Note that a 4:1 system can have the ropes strung to use it as a 3:1 if that is all you need and then restring the pulleys for 4:1 if that days performances require high forces. If the rope has a twist in it, then the ropes as they go through the pulleys, will cause the pulleys to twist relative to each other and the ropes rub on each other causing a great deal of friction and hard to hoist or lower something. There is a special way to coil rope so as not to put a twist into it. Every other coil as you add it goes to the other side of coil so that 1 coil puts in a left twist and next puts in a right twist, canceling out the previous left twist. The easies is to use a wind up spool. If you just coil the rope on your hand just looping it, then each loop as you add it to the coil puts a 1/2 twist in the rope. Often the rope as you get it from the store will already have this twist in it. If you find that the pulleys are twisting. take the ropes out to where you are using just 1 pulley and run the rope up and down a bunch of times letting the twist slowly work it's way out.